Making Moringa leaf powder at home is quite easy but it does take some time to sort and clean and then sun dry the leaves before grinding them in the food processor. Moringa or Drumstick is the wonder tree that is known for its nourishing properties, every part of the tree is edible and medicinal. 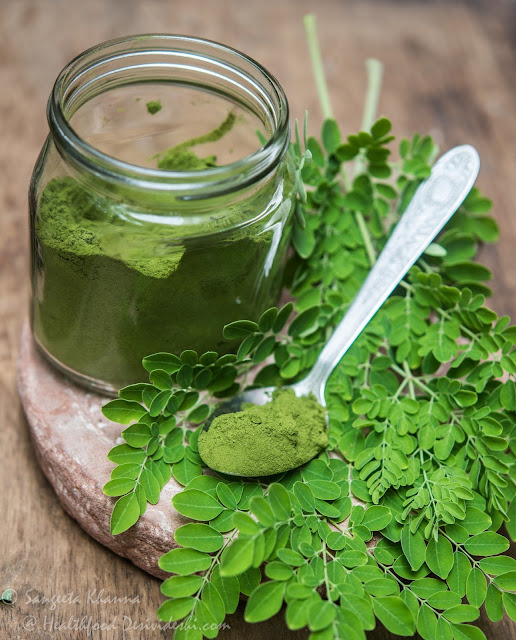 The most impressive quality of Moringa being immunity boosting, it was given to the whole family during every change of season to improve immunity against chicken pox, the most dreaded viral disease of the older times. Now Moringa is being exported in several forms to be used as immunity boosting agent for AIDS patients. 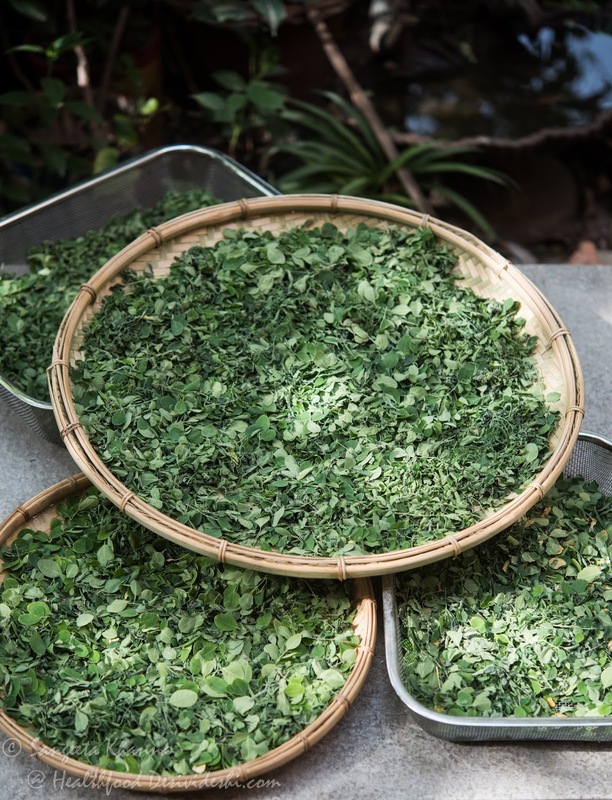 Read more about the benefits of Moringa leaves here. The most wonderful thing about Moringa is that it grows all over India and quite abundantly. The Moringa tree can be propagated easily by seeds or by stem cuttings during rainy season, it can also be grown in balconies and terraces for harvesting leaves which are much more nutritious than the Moringa pods. 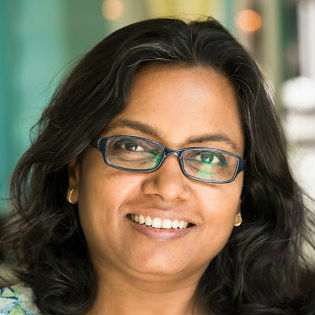 I have shared many Drumstick or Moringa recipes on this blog, many chutneys, egg scrambles and curries respond really well to the fresh Moringa leaves. This sponge gourd curry with Moringa powder a recent favourite. The advantage of using dry powder of Moringa leaves is that it can be used instantly and the taste doesn't mask the other ingredients. 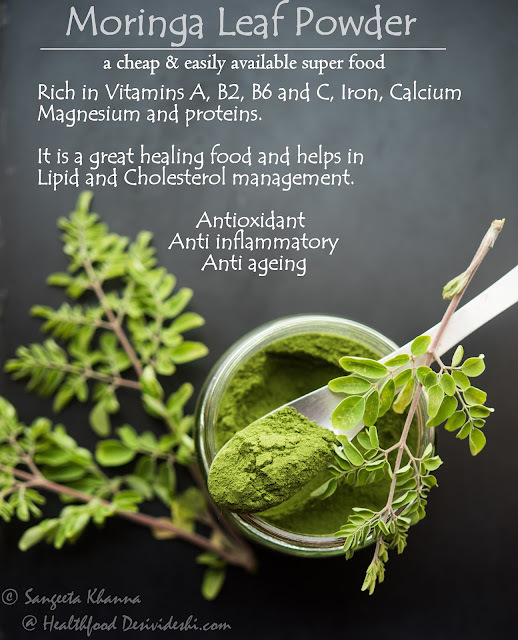 So you can keep experimenting with Moringa leaf powder with many recipes and not feel overwhelmed with one flavour being repeated everyday. I have used it in my dals, khichdi, parathas, breads, curries, raita, buttermilk, chutneys, soups and curries. Some people just dissolve Moringa leaves in warm water and drink it like a dose of medicine everyday, 1/2 tsp Moringa powder is good enough for one person. Get fresh tender leaves of Moringa which is preferably the new growth after the fruiting has ended. This results in a bright colour. The mature leaves of Moringa may cause stomach upset in some people so take care of that and use a very small amount when you use it for the first time. Practice caution when feeding this to babies. Get the leaves plucked along with the stalks, hold all the stalks together and rinse in a large tub of water at least 3-4 times or till the water runs clear. Now let the water drain by keeping the leaves in a large colander, I used my Bamboo sieves that I bring from north-east India whenever I visit. In about 4-5 hours the leaves get wilted and can be separated from the stalks easily by holding them together and pulling downwards. I prefer plucking the leaves in the evening and letting them wilt overnight after the rinsing. After the leaves are separated, spread them in a perforated surface, the bamboo sieves work wonderfully for this as well. I have a few trays made of steel mesh, the old fashioned colander also work. Remove all stalks from the leaves so the powder is smooth. Cover it with a thin dark cloth and sun dry in strong sun (Indian summer is great for such things) till the leaves get crisp. In the peak summer it took just one day to make the leaves crisp but later it took me 2 days. Bring the leaves indoors in the evening and powder them immediately before they loose the crispness. This helps to make the powder really fine. I didn't need sieving the powder but you may sieve it to remove any fibrous residue. Transfer to a clean and dry jar with an air tight lid immediately. The Moringa powder made this way keeps well for at least 6 months at room temperature. To prolong the shelf life you can refrigerate it. Remember you need just 1/2 tsp or 2/3 tsp per person per day if you want to have it everyday. To keep the colour as bright as possible, take care to sun dry the leaves covered but in stronger sun. If the sun is not too bright the colour becomes a little dull but the medicinal properties are not compromised I am sure, though I didn't find any studies regarding this. Note that some varieties of Moringa have bitter and astringent tasting leaves. Chose a variety that has sweeter leaves so the Moringa powder doesn't alter the taste of foods it is added to. I added Moringa powder to the poori dough a few times and the result was great. 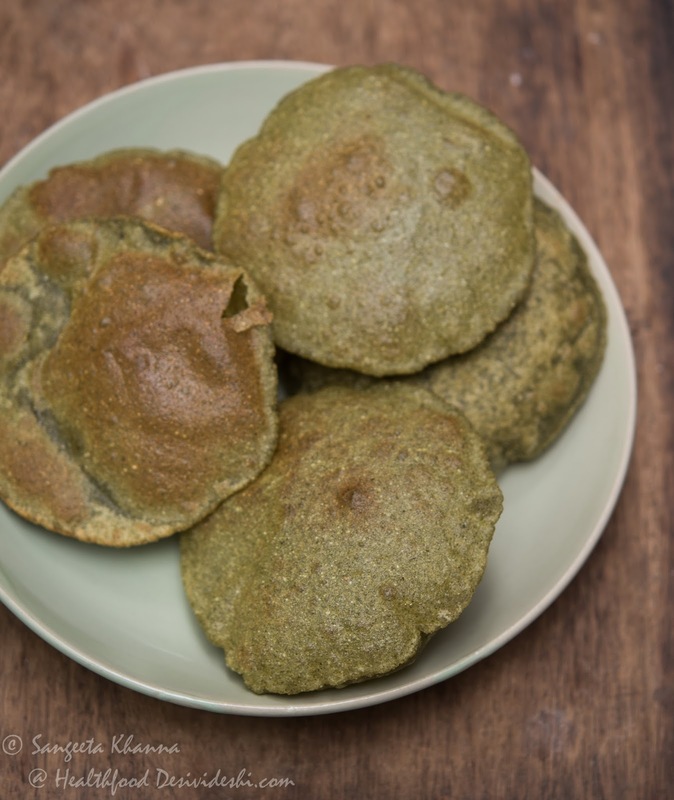 Add 1.5 tsp Moringa leaf powder per cup of flour to be kneaded and you get bright colour in your pooris or parathas. Adding the Moringa leaf powder to pesarettu (green mung dosa) batter also works wonderfully. It can actually be added to any dosa batter. 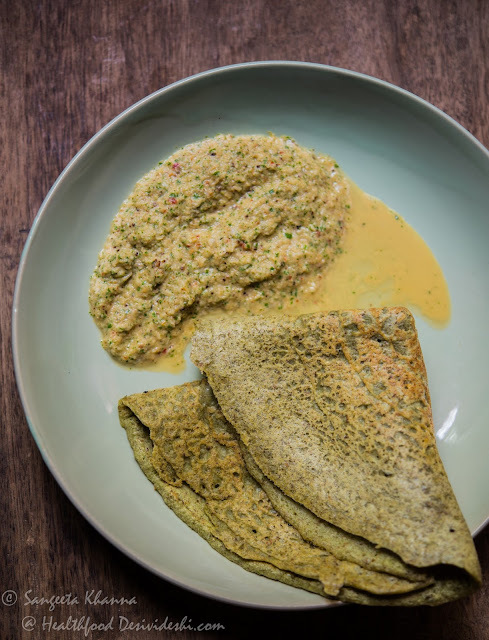 Another variant of a dosa was featured on the ISKON page last month, made with a mix of millets and rice, the moringa powder supplements the dosa with essential nutrients.